Anritsu had a unique opportunity to promote its microwave measurement instruments at MicroWave Week’s trade event held at the Queen Mary docked in Long Beach, California. The location and a theme around light and sound waves led to the “Ride the Waves” tag line used in our invitations. 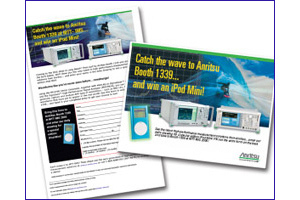 An email, sent to registered attendees, included a form that could be printed, filled out and dropped off at Anritsu’s booth for a chance to win an iPod. Collateral supported this effort with a “bellyband” wrapped around the trade show floor issue of MicroWave Week that was handed out at the door. Result: Anritsu’s booth traffic was nearly doubled from the year before.